One of my fellow Ukraine (now R)PCVs just posted a great piece on her great blog, borscht and babushkas. The post, “#pcukraine,” is a series of Facebook status updates from PCVs in Ukraine about the ridiculous/funny/amazing/weird experiences they have. Go read Kristen’s post, because the statuses there are extremely clever/witty/absurd. I liked this idea but, rather than re-blogging others’ experiences, wanted to share some statuses of my own. I’m not a huge Facebook-poster to begin with, so my updates are not as detailed or witty as those in Kristen’s post, but they do show how little things make life good and I hope they give you a slightly different picture of my time in Ukraine than my blog posts. I may have finished my Peace Corps service 9 months ago — time flies — but it is still very much part of me and I think about it a lot. So while this post may seem “late,” it’s really interesting for me to look at after having been an RPCV for a while. Hope you enjoy it, too; this is a sampling of the best and most insightful statuses. 2 Oct 2010: has survived Week 2 of PST. Teaching for the first time next week! 10 Dec 2010: is sitting in her NEW apartment in her NEW town drinking a Starbucks Via & eating oatmeal while enjoying her counterparts WiFi. Life is good. 15 Dec 2010: stove-top bread pudding = success! Note: This is significant because I didn’t have a working oven in my apartment. 5 Jan 2011: braved the pre-Christmas crowds at the bazaar and is now braving the 3*F temperature for a run. 11 Jan 2011: survived her first day of teaching. 2nd Form: cutest kids EVER. 3rd Form: cute too, but ask a lot of questions in Ukrainian that I don’t always understand. 5th Form: nice class. 6th Form: smart, fun group. 11th Form: fun b/c they know enough English to have discussions. 1 Feb 2011: talked about Romanticism in art with her 11th Form; sang “My Favorite Things” to her 3rd Form; got 3 boxes (spices, COFFEE, etc. ); met nice women while running at the stadium who invited me in for tea & to return whenever I want. 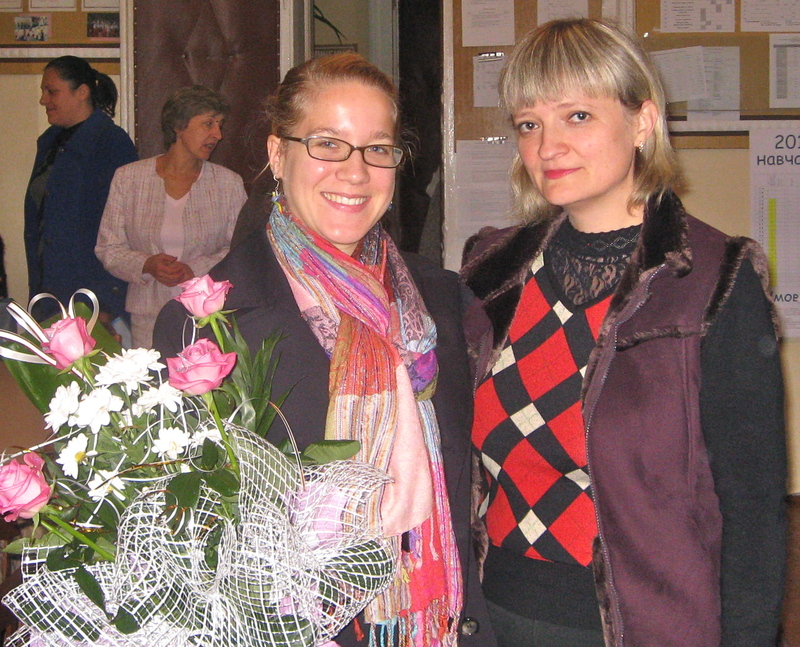 4 Mar 2011: It’s official…Women’s Day in Ukraine is AWESOME. Need some details on Women’s Day? Read this. 17 Mar 2011: “Mrs. Wilkins ironed her dog yesterday.” -written by one of my counterpart’s 4th-formers (one sentence was supposed to be “walk the dog” and the next “iron her clothes”). 10 Apr 2011: made her first Ukrainian borshch today — success! 4 May 2011: loves apple discounts from her favorite bazaar apple man, milk discounts from her favorite babusya, and free baby greens from one of her adult English club-goers. 9 May 2011: tried to write a letter in cursive, but her brain/hand kept trying to form Ukrainian cursive letters instead of English ones! 12 May 2011: Today was a good day. New running shoes & summer dresses arrived from home, & spent a wonderful time at the music school playing the clarinet & listening to live classical music for the first time in almost a year. 17 May 2011: found a thermos in her apartment so now she can make French press coffee, drink some before she runs and keep the rest hot for after the run. 18 May 2011: had an awesome time spontaneously playing an hour and a half of basketball w/ three 25-y/o guys from her English club. 30 Aug 2011: just got foto-sessiaed up the wazoo in 100-year-old Ukrainian traditional dress…pics coming soon. 22 Sep 2011: a good day: received some Italian coffee (not instant!) from Ukrainian friends, my counterpart is finally home with her beautiful baby, I got three letters, & I might be inheriting my landlady’s old washing machine! 2 Oct 2011: CP’s baby’s baptism –> 8 hours of eating and drinking and dancing (and still going strong when I left)…welcome to Ukraine! 4 Oct 2011: I now have a working washing machine in my apartment! Peace out, hand-washing (unless the machine breaks). Note: the machine lasted until my very last week at site, when it decided to start making loud clunking noises; I hand-washed my last few loads of laundry. 13 Oct 2011: A supermarket just opened in my town! 21 Oct 2011: Three girls showed up to my sport club in 43F & rain. Here’s to triumphing over Ukrainian beliefs/superstitions of getting sick from rain & cold, one girl at a time! 9 Nov 2011: found out today that I’ll be teaching English to my town’s police in preparation for Euro2012…starting tomorrow. 17 Nov 2011: Today I bought sweet Ukrainian boots & навчилася вишивати! 29 Nov 2011: HIV/AIDS-themed English club was a relative success…except one girl started crying. I’m hoping it was just because the activity was powerful and not because of some deeper reason. 6 Dec 2011: winter, John Legend, Woody Allen, Jay-Z & Alicia Keys, Dave Brubeck, snowflakes. Just a normal day in English club. 14 Dec 2011: Iryna gave me some cheese that her daughter sent from Germany. I ate a cube and it was like heaven in my mouth. 30 Dec 2011: fully embraced Ukrainian circle dancing tonight & it made for an enjoyable time. 5 Jan 2012: I love walking/wandering around Kyiv. Found a sweet supermarket and saw a totally new area of the city on the way to getting my teeth salt-blasted at the dentist. 8 Jan 2012: L’viv: pampushky (edible and live), lots of walking, The Nutcracker for 30 UAH, kolyadky, mulled wine, chocolate/marzipan, vysokyy zamok, pretty churches, great company…AND homemade (Ukrainian-made!) PEANUT BUTTER at the Christmas market…hard to beat this life. 21 Jan 2012: Нарешті, доїхала додому. Home sweet Sniatyn. 13 Mar 2012: Amazing cultural exchange moment of the day (@ older pupils’ English club): telling/answering questions about the Peace Corps and being told many new things about Taras Shevchenko. PC Goals 2 & 3? CHECK. 29 Apr 2012: In Ukraine the tar melts in the sun. 10 May 2012: My 44-year-old school director died early this morning of a heart attack… A big loss to my school and the Sniatyn community. 15 May 2012: had a wonderful spontaneous evening helping Iryna in her field…and scored some fresh eggs, mint, and rhubarb on the way home. 29 Jun 2012: Today I climbed Mt. Hoverla (2061m) in near-perfect conditions and watched my counterpart’s cousin propose to his girlfriend at the top (she said yes, for the record). All in all, not a bad day. 2 Aug 2012: I am so happy and grateful that, even though my school’s Director (who was most of the muscle behind my grant implementation) died in May, the town administration has upheld their end of the deal and provided the (now-multimedia) English classroom with new desks, chairs, and chalkboard. 21 Sep 2012: Two years ago today I arrived in Ukraine. Seven weeks from today I leave. 10 Oct 2012: After two years in Ukraine I finally see leeks being sold. I show them to Iryna at English club and tell her how excited I am to have found them. She says, “I have those in my garden and in my field!” Ukrained? But in the most wonderful way. 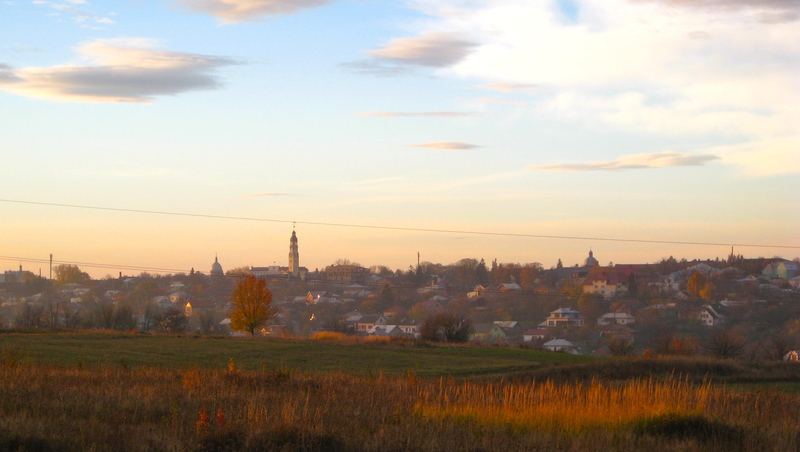 4 Nov 2012: Last run in Sniatyn…then packing, cleaning, and final goodbyes. I shall miss this little town and its inhabitants. On the train to Kyiv — one-way — tonight with K for our last few days in Ukraine. 7 Nov 2012: Advanced-Mid Ukrainian YES. 8 Nov 2012: Today I rang the COS bell — yes, there’s now a bell — and became an RPCV (though I haven’t “returned” quite yet). Thanks for an amazing two years, Ukraine. Yes, that’s right — today I turn 25. A quarter century! I certainly don’t feel that old. I spent my previous two birthdays in Ukraine. Two years ago I was actually working at a camp run by a fellow PCV — my “team” gave me a lovely framed picture as a gift, and I believe flowers and cake were also involved. Last year I was at site in Sniatyn and remember having a delicious-as-always pizza lunch at Kapryz with Janira and Natalia; other Natalia gave me a leather wallet from her shop that I’d been eyeing and Ilona gave me a ring/earring/necklace set; it was a Wednesday, so there was English club and my adults gave me some really nice gifts, flowers, and well-wishes. This year’s birthday finds me in Münster, Germany, where F studied. We’re visiting friends here and, because F’s dad shares my birthday, we’ll go to his parents’ tomorrow for weekend celebrations. But this post is not to tell you about how I celebrate my birthday; rather, it’s to reflect a bit on the past year and share the traditional birthday wisdom, as I did last year. The past year has been one of great changes: I finished my Peace Corps service, having to say goodbye to two years’ worth of accumulated friends, acquaintances, colleagues, and places (not to mention stuff); I moved home to my parents’ for a couple of months, then uprooted again to move to London. Since my last birthday I’ve run one half marathon, a 10k, and a bunch of 5ks (including a PR/PB) — now I’m “aging up” in road racing (darn! ), so the competition gets stiffer. I also returned to formal education, earning a CELTA and being accepted to an MA program at University College London beginning this September. Give yourself time to adapt to change. Don’t be too hard on yourself or expect yourself to immediately feel at home in a new environment or living/working situation. Focus on one thing at a time, living in the moment and addressing each new thing as it arises, and adjustment will eventually come. I wish you all another year of change and adaptation. This entry was posted in celebrations/holidays, CELTA, community, English Club, family, Highlights, Musings, Peace Corps, pictures, running, travel on 27.06.2013 by taplatt. Monday: “Easy” day of observing three of my classmates teach. The group of students was quiet and had sort of a strange dynamic…I felt a bit bad for my colleagues, who were trying desperately to engage them. But each person’s lesson segment went well enough and I was impressed with G’s lesson structure and flow. Tuesday: We observed “real” teachers for an hour before having a session on “teaching listening skills.” Two of my classmates and I observed Jess (an Oxford House College teacher) teaching an upper-intermediate class; they were an energetic group with good English, and though Jess herself seemed a little scattered/flustered, she did some interesting matching activities and got the students talking. Give the students a clear task to concentrate on while listening to the text. Without a task, the students won’t know what to listen for and will get bogged down in the details or just space out. Like with reading, one can listen for gist, listen for specific information, listen for detail, and listen for inference. After listening, make sure to get feedback and make sure that the students understood the task. If they didn’t, explain the task again and play the listening once more. Thursday: Teaching 30 minutes to the upper-intermediate students. I was last to teach of three in a grammar lesson on question tags (“You’re from America, aren’t you?“) and I needed my colleagues to teach the class about question tags before my segment, which was about practicing them. Sasha and Denis did a great job familiarizing the students with question tags and teaching them the rules, which made my lesson go smoothly. The students had to do a long activity that included matching the correct question tags to statements, then working with a partner to match the correct answers to the question tag-statements. At the end, I asked each student to write a few questions tag-statements of their own; then we mingled as they asked and answered each other’s questions. I was happy with the entire lesson, except for a small part in which I should’ve done some language or content feedback rather than go over the answers to the exercise. (While I was teaching, I realized how fun it really is for me. I had a blast up there, talking about grammar and chatting with the students. I must be in the right field.) My colleagues and tutor gave me positive feedback and I was again given “above standard” for my lesson — yeah, baby! Saturday: We had two main sessions. The first focused on “introducing new language”; that is, teaching a new grammatical or lexical (vocabulary-based) item. The three things that must be covered for any new language are: 1) meaning, 2) form (structure), and 3) pronunciation. After these three things have been introduced and studied, you can move to controlled practice followed by freer use of the language item. There are various ways to teach each segment in new language. The second session was all about lexis. “What is lexis?” you may ask. Well, lexis includes lexical items (fixed units with one meaning), which can be single words, collocations (word combinations that fit together, like “unrequited love”), or idiomatic phrases. We talked about teaching patterns of usage to students; for example, the verb “put” is always followed by a noun and a place (“Put it in the bin“). Looking at patterns — or chunks of language — rather than hard and fast rules will help students integrate their knowledge and intuitively understand how to use certain language patterns. In sum, it was a decent week of class. Next Thursday I’ll teach another 30-minute lesson and we’ll have a session on teaching grammar. I also need to work on Assignment 1 (more on that later). This entry was posted in CELTA, education, English Club, language, literacy, music, teaching on 26.01.2013 by taplatt. After 26 months outside of the USA, on Monday I returned to my hometown of Rochester, NY as an official Returned Peace Corps Volunteer (RPCV). Seeing my parents wasn’t so shocking, since we’ve skyped every weekend for two years and we’ve seen each other in person twice over that time. What first shocked, overwhelmed, and even disgusted me was how much stuff I have here: clothes, bags/purses, miscellaneous bathroom products, shoes… Stuff that I have clearly done without for the past two years. If living in Ukraine taught me anything, it’s that one doesn’t need much in the way of material goods in order to live comfortably and happily. I have already started purging my closet and will donate as much as possible over the next month. In some ways, it feels like I never left the States. It’s amazing how easily old routines return: the morning after I got home, I got up and went to the athletic club for a yoga class with one of my favorite teachers. Driving a car for the first time in over two years felt easy, like I’d just done it the day before. But it did. Nice messages from my pupils and friends back in Sniatyn remind me of that. Two of my 10th-formers have made it to the third round of FLEX, a program that allows Ukrainian kids to do a high school exchange year here in the States. Little things remind me that I’m not in Ukraine anymore: yesterday I went to Barnes & Noble and paid in cash; I owed $0.51 and told the cashier that I had exact change. I gave him a quarter and a penny, thinking “that’s perfect!” A minute later he said, “you’ve only given me $0.26.” I quickly realized that I’d thought one quarter was $0.50 because it’s almost the same size as a 50-kopeck piece! “Sorry, I’ve been abroad for two years,” I said sheepishly as I handed over another quarter. I have too many answers for that question: My English clubs. My pupils at school. My colleagues. Learning another language. Becoming integrated into another community and culture. Sometimes I feel guilty that the transition back to the States feels too easy. Shouldn’t I miss Sniatyn more? Well said. No matter where I go or what I do, Sniatyn, and Ukraine, will always be with me, in my heart and mind. This entry was posted in community, culture, education, English Club, exercise, family, language, Peace Corps, Things Ukrainians Write, travel on 16.11.2012 by taplatt. My two years in Ukraine have come to an end. You’ve read the final letters my 11th-form pupils wrote to me. 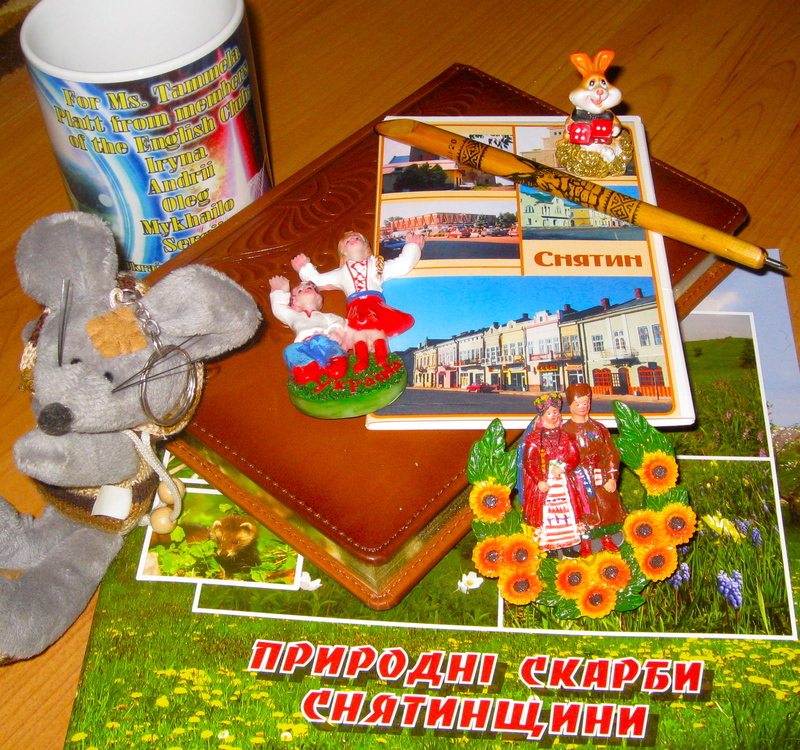 My last week in Sniatyn was filled with notes, gifts, and wonderful sendings-off from friends, colleagues, and pupils. My 8A pupils have not come to English club all semester — it has been hard to find a time when the majority of them could come, so I’d resigned myself to just seeing them during lessons. But on Wednesday at school, some of the girls asked if we could have English club that afternoon. “What time?” I asked. They proposed 4pm, which was perfect, an hour before my adult/older pupils’ club. So I showed up and seven of my girls were there, armed with OJ, cookies, and M&Ms, which they professionally portioned out after they pushed two desks together with chairs around them so we could sit in a circle. “Let’s talk about Halloween!” Olha said. So we started with that and progressed into topics such as the practicality of UkrEnglish, pets, siblings, and more. It was a joyful, relaxing hour. 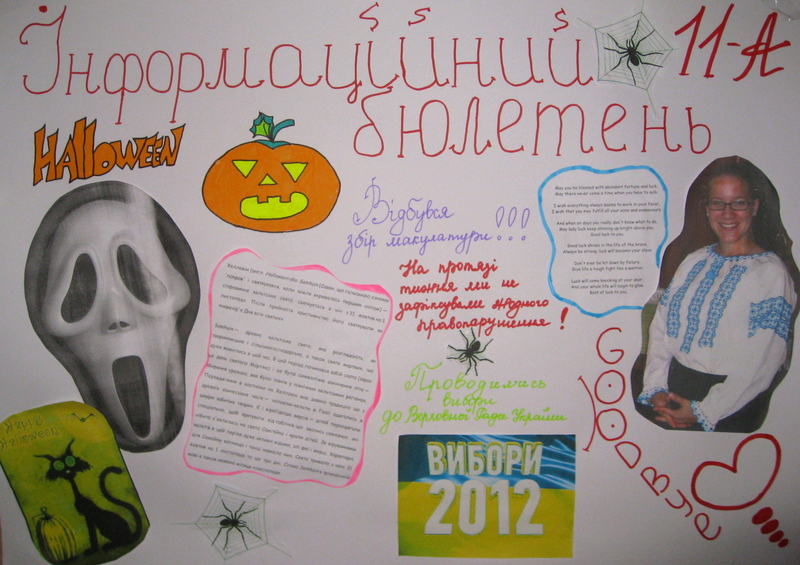 Nastia, Nastia, Marta, Marta, Olha, Inna, and Roxolana are some of the pupils who have most brightened my work at school. Smart, intelligent, funny, creative young ladies with excellent English. After my 8th formers left, the adults and older kids came in for the last English club. This English club group has been one of the highlights of my time in Sniatyn. It has been wonderful to get to know some of my pupils better and in a different context than English lessons. Some of them have become more like friends than pupils — at least we have a slightly more relaxed relationship than I do with most of my other pupils. And it’s been great to have met such an interesting cross-section of the Sniatyn community in the adults who have attended my club: they said on Wednesday that they wouldn’t have met each other if it hadn’t been for English club. They are all different ages and professions: dentist, epidemiologist, history teacher, piano teacher, gas company worker…It’s so cool that English club brought us all together. Dear Ms. Tammela! Thank you for your being in Snyatyn. Thank’s for English clubs, Sport clubs, for lessons, for preparation for FLEX. Thank you for all! // It was so interesting to communicate with you. You studied me many different and important things. You gave me many beautiful lessons which I will never forget! // This book is about plants and animals in Snyatyn’s region. They all are belong to Red Book of World. // I wish you great health, happiness, many pleasant emotions and positive feelings! You are so beautiful person! Don’t forget me! Christina K. // P.S. I hope we will see in the future! 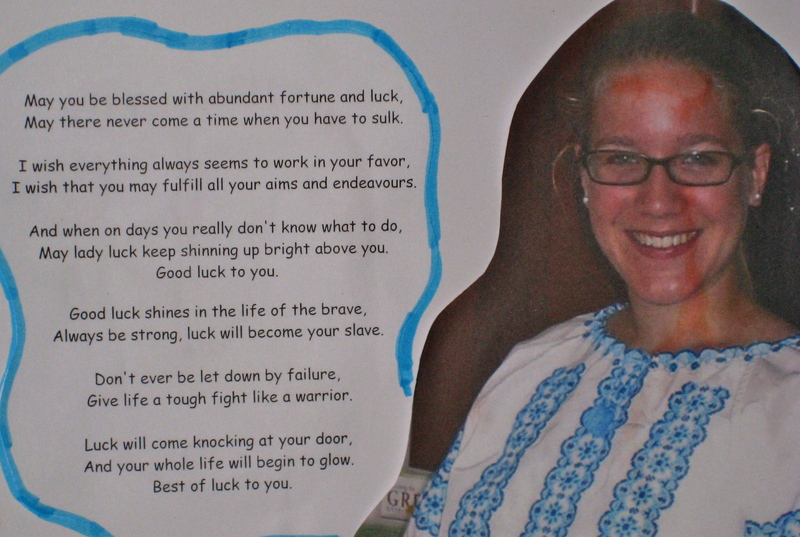 Dear Tammela // Thank you for your dedication, kindnes and skils // I enjoyed all time wich we spended together // Oleh S.
…because they put a lovely “good luck” poem on the poster for me! The goodbyes continued on Thursday when I had my last lesson with my 4b class — they have also been a favorite class of mine and it has been fun to co-teach them with my colleague, Natalia. I said “good morning” to the class and then Roman came up and opened the sides of the chalkboard, revealing an adorable message (in English!) saying goodbye to me and telling me to return. Then multiple kids came up to me with flowers and gifts and gave little speeches, wishing me well and telling me not to leave (or at least to come back and visit). I received a big doll in Ukrainian national dress and Alina told me (in Ukrainian), “when you come back to visit you must be wearing a costume like this!” A few of them gave me cards, two of which I quote here: 1) “We will Miss you at Miss Temella. Come more” — short and sweet! 2) “Miss Tem!!! Thank you for evereting you do for us. With you was very interesting. I wish you a good travel at home. Taras Beltsyk Form 4-B — I’m pretty sure Taras has a parent who knows at least a little English. If not, I’m even more impressed. Love them. I was prepared for something from the teachers during Friday’s morning faculty meeting. 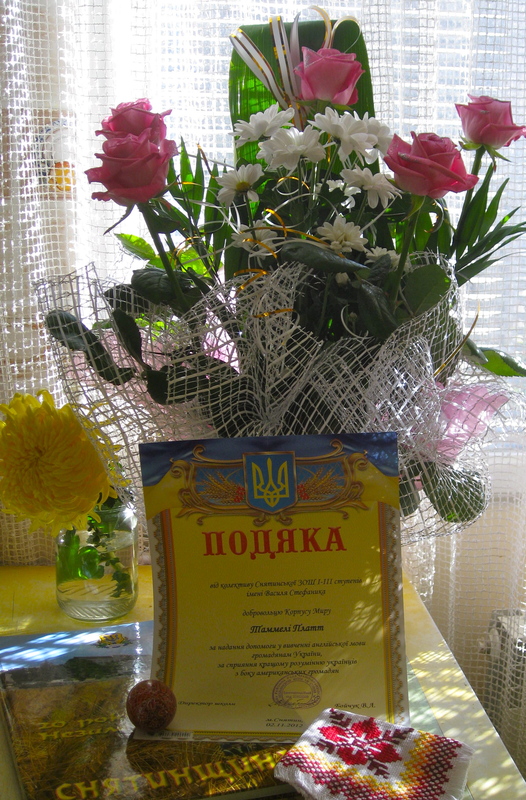 Our school director, Viktoria Liubomyrivna, presented me with flowers and a podyaka (thank-you certificate…Ukrainians love these) and I gave a little thank-you speech as well. Nadia Mykhailivna, widow of our late/former director, gave me a beautiful, real pysanka (painted egg) and rushnyk (embroidered towel) that she and Viktor Mykolaiovych had bought at last spring’s school yarmarok (market) — “na pam’yat’,” she said. “For the memory”). My last lesson on Friday was with Nadia Mykhailivna’s class, the 10th form, a hilarious and energetic group of kids. They also presented me with well-wishes and some nice gifts. Poor Katya almost broke down and had to restart her heartfelt word a few times, causing me to tear up as well! Even more gifts! How will I get all of these home? After school, the English teachers (minus two) and I went to the restaurant where we always celebrate after the First and Last Bell ceremonies: Vechirnyy Sniatyn. We shared a few hours of tasty food and conversation; as Diana Dmetrivna said, we have been not only colleagues but have also become friends. These are the people who have made my time in Sniatyn so worthwhile. We had short lessons on Saturday to make up for Monday’s day off after the Ukrainian parliamentary elections. My 11th form invited me to a concert they organized as a farewell for me! It deserved its own blog post so click here to see photos and videos of my talented pupils. With school farewells finished, that left Sunday and Monday to say goodbye to Halya and her family as well as Natalia and co. at her shop. I spent a relaxed couple of hours at Halya’s place on Sunday evening, sharing a light meal and champagne with lemon (have you ever had that? It’s actually pretty tasty) with Halya, Oksana (her mom), Yuliana (her aunt/my landlady), Pavlo (Halya’s cousin), Sasha (Halya’s husband), and Mark (their 14-month-old son). Conversation is always interesting with them, and the food is always good. I’ll miss chatting with them in the back yard and celebrating holidays with them. After running (and showering), I headed to Natalia’s shop one last time to have coffee and conversation with Natalia, Ilona, Petro, and Nina. I gave them a bunch of extra things I didn’t need, and they liked the photo albums I’d made for them. So that’s it. Someone from Halya’s family will drive me to the train station in a few hours and tonight I’ll be on my way to Kyiv for three more days in Ukraine. If all goes as planned, on Friday I’ll become a Returned PCV (RPCV). Hard to believe and quite bittersweet — I couldn’t have asked for a better service. N.B. : Click HERE to see more photos of the classes and teachers and English clubbers I’ve worked with for two years. And click HERE to see my “scenic Ukraine” album — the best photos I’ve taken of Ukrainian landscapes and more. This entry was posted in books/literature, celebrations/holidays, community, culture, education, English Club, exercise, family, food, Highlights, Kyiv, language, literacy, music, Peace Corps, pictures, running, teaching, Things Ukrainians Write, travel and tagged art, news on 05.11.2012 by taplatt. This entry was posted in books/literature, community, culture, education, English Club, exercise, Highlights, Kyiv, language, literacy, music, pictures, teaching, Things Ukrainians Write, travel on 31.10.2012 by taplatt. My pupils at school, especially the 11A, 8A, and 4b classes (yeah I know I’m not supposed to have “favorite” classes or pupils, but I totally do and I’m pretty sure every teacher does. Some are just better at hiding it). My wonderful English-teacher colleagues, who have been great to work in parallel to and teach with: Diana Dmytrivna, Nadia, Natalia Mykhailivna, Halya. Running along the Prut River/canal. Doing speed workouts at the stadium on the jacked-up 350m asphalt track while the morning walkers walk. Running on my absolute favorite road, atop a hill a mile or so away from the center of town — I think the official name of the street is Hohols’koho, but I call it “the high road” or “up top” in my head. 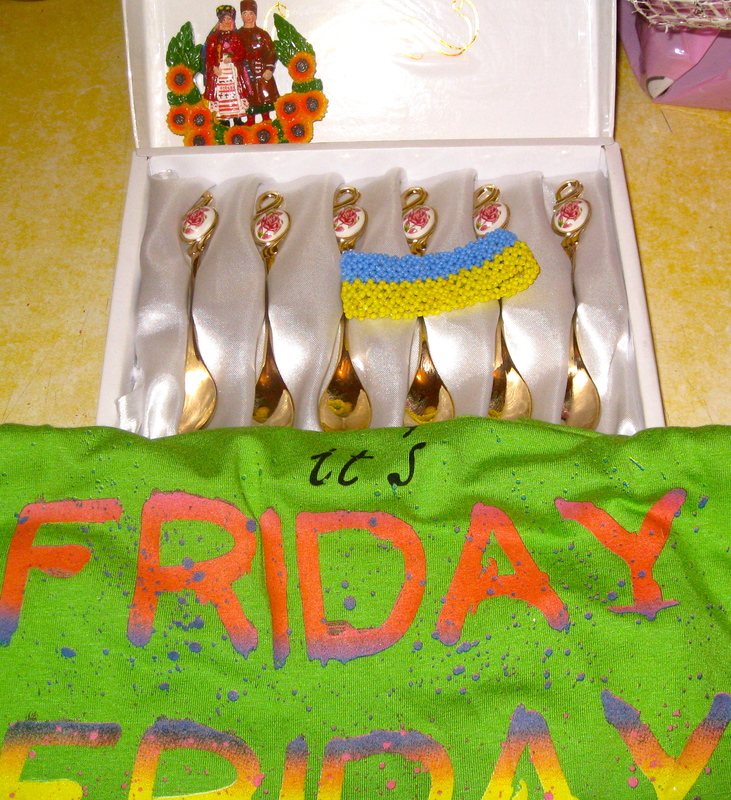 Weekly food morsel exchanges with Iryna — she or I bring something we’ve picked or made for the other person. The exchange usually happens at the end of English club on Wednesday evenings. Being invited to help Iryna in her garden or field, and/or to join her on an excursion in the spring and summer. Being 2-7 minutes away from pretty much anything I might need to buy. Sniatyn’s fantastic bakery — especially their horishky and trubochky cookies and buying still-warm loaves of bread. My apple (and walnut and pear) man at the bazaar, who always gave me discounts. Watching adorable Ukrainian children recite rhyming “greetings” on holidays. Being able to tune out conversations because they’re in another language and I will only understand if I listen carefully. …and more. But I also have many things to look forward to, and to paraphrase my friend and fellow PCV Kate, I’m lucky to have had something that makes it so hard to say goodbye. This entry was posted in celebrations/holidays, community, education, English Club, exercise, family, food, health, Highlights, language, literacy, running, teaching on 25.10.2012 by taplatt. Yesterday was my third-to-last English club, and it was one of those meetings that made me realize how much I’ll miss my English clubbers when I leave. Recently I’ve combined my older pupils — 10th and 11th formers — with my adults, and yesterday we had a pretty balanced group: five adults and seven pupils. I wanted to make them somehow work together, so I devised two activities that I thought would be fun for everyone; I think it went quite well. Tanya: Океан Елзи (Ukrainian rock group), С.К.А.Й. (Ukrainian rock group), a Sting album, a Yann Tiersen album (he wrote the soundtrack to the film Amelie), and an album by another Ukrainian singer whose name I didn’t recognize. Tanya decided to take a book about “how to survive on a desert island” (smart choice!). Mykhailo: Океан Елзи, The Beatles, Beethoven’s “Moonlight” sonata, a Scorpion album, The Eagles. His book? A Ukrainian-English dictionary! Oleh S.: Heart’s Happiness, Florence and the Machine, an album of greatest club music hits, an album of Ukrainian and Polish folk songs, and all of Bach’s works (how he’ll get that onto one album, I wonder…). Oleh would take The Bible to his desert island. Serhiy: music of Vysotskiy (a Russian singer), an album of a Ukrainian rap singer whose name I didn’t catch, and a few other Ukrainian/Russian singers. Serhiy’s book: Jules Verne’s The Mysterious Island. Yulia: the new Three Days Grace album, KORN, Slipknot, Papa Roach, and 30 Seconds to Mars. She’d take Charlotte Bronte’s Jane Eyre. Vlad: three Nickelback albums, Flo Rida, Pink Funhouse. Vlad would take a Russian trilogy called Absolute Warrior. Iryna: jazz for a light mood, Bach’s organ music (for a sad mood), Mozart symphonies, Romantic piano music, and an album of Impressionist music from composers such as Debussy and Ravel. Iryna would take a book by Yuriy Izdryk, a contemporary Ukrainian writer. Andriy: an album of the greatest R&B songs, an Aventura album, three albums of Ukrainian folk and patriotic music. Andriy would take a book like Defoe’s Robinson Crusoe to teach himself how to survive on the desert island. Christina: Друга Ріка (Ukrainian rock group), Tokio (Russian rock group), an Argentinian band whose name I didn’t catch, Lama (Ukrainian group), and С.К.А.Й. Christina’s book: a big picture-heavy book of Sniatyn! Oleh K.: Вправо Вибору (his own band! ), a metal band whose name I missed, TOL (Ukrainian new metal), In Flames, and AC/DC’s “Back in Black.” He’d take a book of European mythology. Marta: С.К.А.Й., Adele, Друга Ріка, Dozen Dreams, Nickelback. She’d take a book called Blood and Milk. Tammela (that’s me! I played selections of each of my choices): Beethoven’s complete symphonies, Mahler’s Symphony No. 2, Mozart’s Don Giovanni, Ingrid Michaelson’s greatest hits, and Shaban und Käptn Peng. I’d take the complete works of Shakespeare as my book, because I’d probably have plenty of time on the desert island to make my way through. Can you guess the ages and/or professions of these people? Who’s a pupil and who’s an adult? This entry was posted in books/literature, community, education, English Club, Highlights, language, music, pictures, teaching and tagged podcasts on 11.10.2012 by taplatt. Summer English club got a lot more interesting when, halfway through July, I found my classroom without desks or chairs. Luckily, this has happened before (like when the school has been mysteriously locked) and we have a backup space to meet: the будинок школяра (literally “schoolchildren’s building”), to which Oleh can get a key because his band rehearses there. But so much for multimedia clubs and film night…it was back to planning technology-less clubs like I did for the first few months at site. After the groups shared their things in common, I decided to challenge them and test an activity I’d never used before: a collaborative story. Every group had to begin their story with the same sentence. I gave them “Once upon a time, there lived an old man…” Each group had to choose one person to write and then work together to compose a story based on the first sentence. I was so impressed with the results that I asked to collect their stories (I got all but one) because I wanted to post them here. A year ago, even six to eight months ago, they would not have written such creative stories. I am amazed at how much my club attendees have grown and improved in their creative and critical thinking skills, teamwork skills, and English (of course). Read the stories below. I’ve not changed anything except for some corrections for clarity in brackets. I have listed the authors and their rough ages to show the distribution; the person who physically wrote the story is listed first. The groups wrote these in about 20 minutes. Once upon a time there lived an old man. And he lived in a magic forest. One day he went fishing. Suddenly he felt [fell] in the lake. He though[t] he will die. But a terrible mermaid saved his life. She said him: “I saved youre life and you must do my 3 wishes: a) you must marry with me…” The old man didn’t listen last 2 wishes and start to run. When he ran he saw a young hot girl it was a red ridding hood [Little Red Riding Hood]. And she said him: “Marry me”. The old man said “Yes”. And then he wake [woke] up and said “I’ll never eat a strange mushrooms”. The end. Written by Oleh (23 years old, history teacher); Ira (~18 y/0, university student); and Lilia (16 y/o, just starting university). Once upon a time there lived an old man, who was lonely. 50 years ago he met his love of all the life. Unfortunately, he lost his sweetheart, because the war had begun. During his life he hasn’t [hadn’t] forgotten his love. And when he was 70 he has already found this woman. She’s as beautiful as 50 years ago and she’s still lonely too! So, he decided to visit their favourite restaurant, where they have [had] met. An [The] old man was surprised when he realized that she work there! It was the amazing meeting! They were speaking all the night and met the sunrise together. Their happiness was so short. An [The] old woman was ill and she knew that she will die in a few days. She must say goodby. And their love was so short like 50 years ago. Written by Yulia (17 y/o, just starting university); Oksana (22 y/o, medical college student); and Marta (~13 y/o, 8th grader). Once upon a time there lived an old man. Who was a spaceman. He saw an alien when he was in his space trip. He fall [fell] off the space ship of an alien flied [flew] in black hole. He found an alien city and met friendly alient [aliens]. The alients showed him their home, city, culture, customs. In the evening he tried enlient [alien] dishes, drive their car, thanked them and invite[d them to] visit our planet. When he came back he began to tell this story [to] his friend, and then this an old man visited a mad house. We jealous of him because he visited alients. We are so sorry that people didn’t believe him. Written by Nastia (~13 y/0, 8th grader); Katya (15 y/o; 10th grader); and Ivan (~20 y/0, university student). Once upon a time there lived an old man. His name was Petro. It was a crazy man, who like to drunk alcohol and then he liked to smells flowers every day. He had a lot of friends and he liked to dance, to sing songs and to say funny stories about his flowers. Their friends were very funny, too and all of them liked flying pigs and vegetables, which could talk to them and there [those] were the most exciting days of their lifes. Also, this boy Petro had a dog and a cat. He hadn’t a good imagination, so he named his pets like Belka and Strelka. His pets were very friendly with him, so every time, when he was very drunk they saved him and pulled him to his home, put him to his bed and sang a lullaby. Also they cooked a meal for him and also they have a friendly mouse that gived [gave] a piece of cheese to cat Strelka and the cat gaved this cheese to the dog, which gaved this cheese to Petro. Petro lived happy all his life. He road [rode] into the rainbow and catch [caught] a squirell that pursued him all his wonderful life. All. Written by Tanya (16 y/o, 11th grader); Ira (15 y/0, just starting college); and Serhiy (~45 y/o, doctor). I wasn’t able to collect the last story, but it was about a man who worked on a community farm and then sold everything and spent all his money on lottery tickets but did not win anything. There was one great sentence that went something like, he held the envelope with shaking hands. Written by Andriy (26 y/o, dentist); Natalia (31 y/o, businesswoman); and Ira (? 18 y/o, university student). Which story is your favorite? Let me know in the comments below! 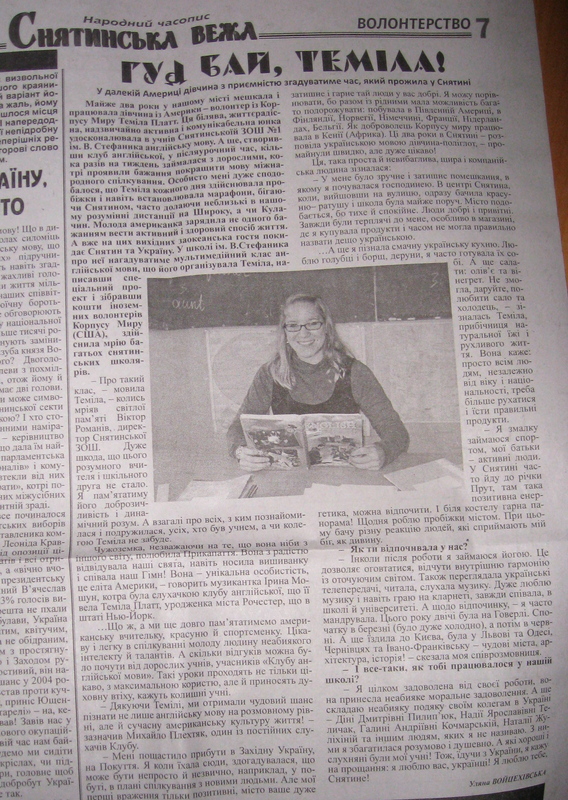 This entry was posted in community, education, English Club, Highlights, language, literacy, Peace Corps, teaching, Things Ukrainians Write, travel on 02.08.2012 by taplatt. Days 1-2: Kyiv. D&T arrived on Saturday afternoon. After picking them up at the airport, we settled into Hotel Ibis and then I walked them down to Khreshchatyk for a tasty Indian dinner and stroll along the closed-for-pedestrians-on-weekends street. The next morning we ventured out to Kyiv’s big Botanical Garden. We spent a lovely couple of hours strolling among the just-past-peak lilacs and getting slightly lost in the forest and meadows. 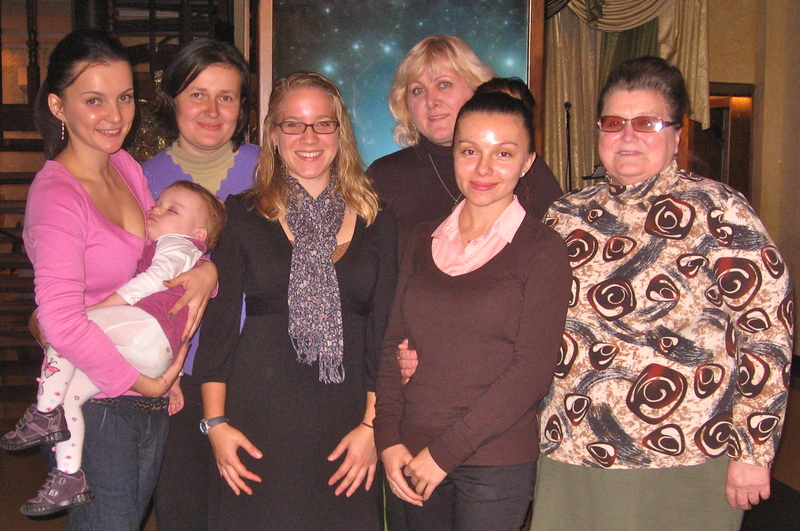 Day 3: Visit to the Host Family in Kolychivka. My parents got the full taste of Ukrainian village life and hospitality when we visited my host family in the village where I trained almost two years ago. Anya, Serhiy, Dianne, & Terry all seemed to get along well and we were lucky enough to arrive just three days after Anya & Serhiy’s pig had been killed. Fresh pork and sausage for all! Day 4: Kyiv. Back in the city for one more day, we hit up all the churches (St. Sophia’s, St. Michael’s, St. Volodymyr’s, glimpsed St. Andrew’s) and checked out the Pinchuk Art Center, which had a great Anish Kapoor exhibition. An easy overnight train ride — except for the fact that I was sick with a fever and chills — with a whole kupe to ourselves, got us to Sniatyn before 9am on Wednesday morning. 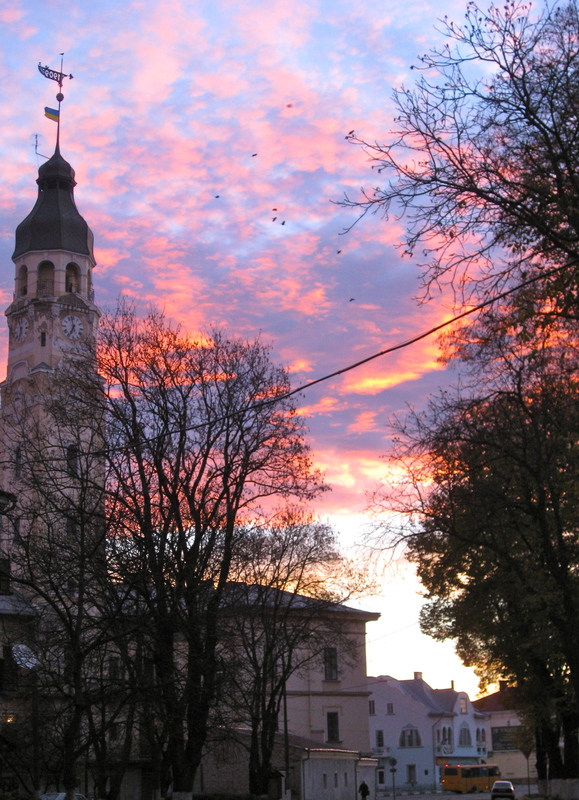 Days 5-12: Sniatyn, Kosiv, Chernivtsi, & the Carpathians. As soon as we arrived in Sniatyn, I thrust my parents into school life. The first day, they accompanied me to school and chatted with my 5th, 8th, and 7th formers as well as my adult English club. D&T were great sports about it (thanks again, guys!) and everyone really seemed to enjoy talking to them. They covered such topics as hobbies, favorite animals, traveling, wearing seat-belts, and even recycling and the environment. On Sunday we met my friends in Chernivtsi for lunch and a bit of a stroll around the beautiful center of the city. 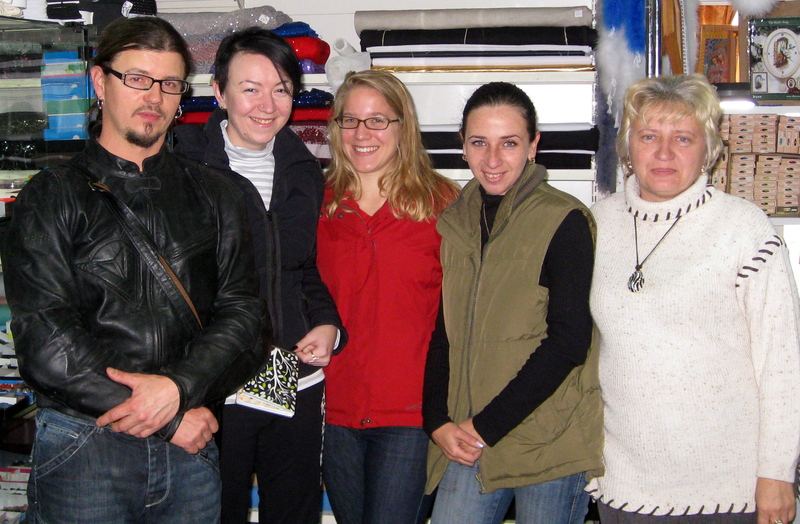 Upon arriving back in Sniatyn, we immediately met up with Natalia, Petro, and Vika to ascend the clock tower (ratusha). The evening was pretty clear so I got some great pictures of Sniatyn from above. On our way down, the man who let us up — who also happens to be the man who is responsible for the clock’s functioning — opened up the clock box and explained how all the mechanics work. We even got to see it strike 7pm. The next couple of days were quiet and relaxed, with walks around Sniatyn, another English club, and a wonderful shashlik dinner with Halya and her family (my wonderful counterpart/neighbors). D&T even got to experience the unpredictability of Ukrainian life when the entire town’s gas went out for a day! Wednesday was a full day, as we’d arranged to go on an excursion to the Carpathian Mountains, guided by Mykola from Kolomiya. He was fantastic, and led us on the “Graffiti Stone” hike — complete with a thunderstorm that caused us to walk/run down a shortcut and hide out in a partially-built house until the rain slackened. After the hike, we stopped to see three master crafts(wo)men on the way home. The master weaver in Yavoriv does everything from start to finish: shearing the sheep, washing and brushing the wool, winding it into yarn, weaving the blankets, washing and brushing them. We saw a 5th-generation master ceramicist in Kosiv, who makes and paints all her ceramics in Hutsul style and colors (green, yellow, brown). Lastly, still in Kosiv, we stopped at the house of a master woodcarver; he doesn’t sell his best work because he says they’re like his children. So they hang on one wall of his living room like a small museum — really amazing work. He also collects pysanky (painted eggs). Day 13: 18-hour train ride to Odesa. Days 14-15: Odesa. D&T’s last day and a half in Ukraine were spent in Odesa, a city I’d not yet visited. The center is beautiful, especially the architecture. We walked around a lot, hitting the Potemkin Stairs, an art museum, the pedestrian street (Deribasivs’ka), and even catching part of an outdoor performance of Aida in front of the gorgeous Opera & Ballet Theatre after a delicious Georgian food dinner. Part of Saturday was spent sitting outside under an umbrella at a cafe while rain poured down. Saturday morning we went for a walk before I dropped Dianne and Terry off at the airport. I spent Saturday evening wandering around a bit and enjoying some quiet time before I flew to Germany for a wonderful week with my wonderful boyfriend in Muenster. This entry was posted in celebrations/holidays, community, culture, education, English Club, food, geography, Highlights, Kyiv, language, Peace Corps, pictures, PST, travel on 13.06.2012 by taplatt. To all you mothers and mother-figures out there: Happy Mother’s Day! Mothers are such important people in our lives and society. Good thing we have a day to celebrate them (though really we should celebrate them every day). This entry was posted in celebrations/holidays, community, English Club, language, pictures on 13.05.2012 by taplatt. A few months ago, I contacted Darien Book Aid to request a shipment of 20 pounds of books for my school here in Ukraine. DBA is a non-profit, volunteer-run organization that sends books to Peace Corps Volunteers and others all over the world, free of charge. It seemed silly not to take advantage of this opportunity. After sending in my request, all I had to do was sit and wait for the books to arrive. I received word last month that my books had been sent on 13 January, and they arrived this week. Twenty pounds of books is a lot of books! They sent me many young adult chapter books, some easy books for young readers (or beginner English-speakers, as the case may be), and two textbooks on health and teaching health in schools. I cannot wait to present all the books to my colleagues at school — it will be quite a surprise for them. At this point I’m sort of at a loss for how to start incorporating these books into my teaching life. I’ve thought about creating a library in the English classroom, where pupils can check out books to read at home. I may make photo copies of a chapter at a time to read in English clubs. Or maybe I’ll just read them to people as a listening exercise. Any suggestions for how to use chapter books in the ESL/EFL classroom would be greatly appreciated! Please leave a comment or email me if you have ideas. Below are some pictures of the box’s arrival. Thank you, Darien Book Aid! In other news, it’s still really cold here. In case you haven’t been reading any news, it’s been <9°F/-13°C here for the past two weeks. School was cancelled last week because it was too cold for the kiddies to walk to school. Teachers still make an appearance every day. This week the primary schoolers were free and we had short — 30′ — lessons with the 5th-11th forms Monday-Wednesday; no school Thursday or Friday. I’ve still been running, of course, because I’m crazy and addicted like that. But I would really like it to warm up again soon — anything above 10°F, please! — so I can do a proper long run. My grant implementation is under way — money’s in the bank and my director and I are going soon to buy the equipment. Thanks to everyone who donated. You can check out picture updates here. In random “go Ukraine!” news, I just read this interesting BBC article about the origins of European coffee houses — apparently a Ukrainian in the 17th century was one of the first to brew a cup of coffee in a cafe (or something) in Vienna. The Euro-type coffee house has definitely made it’s mark in L’viv, where there are tons of cozy cafes. Read the article for more details. In other random suggestions, read Byron’s epic/satiric poem, Don Juan. It is absolutely hilarious. Lastly, if you haven’t heard yet, Oberlin is ranked #3 among small colleges for Peace Corps Volunteers! 24 of us are currently serving as PCVs around the world. 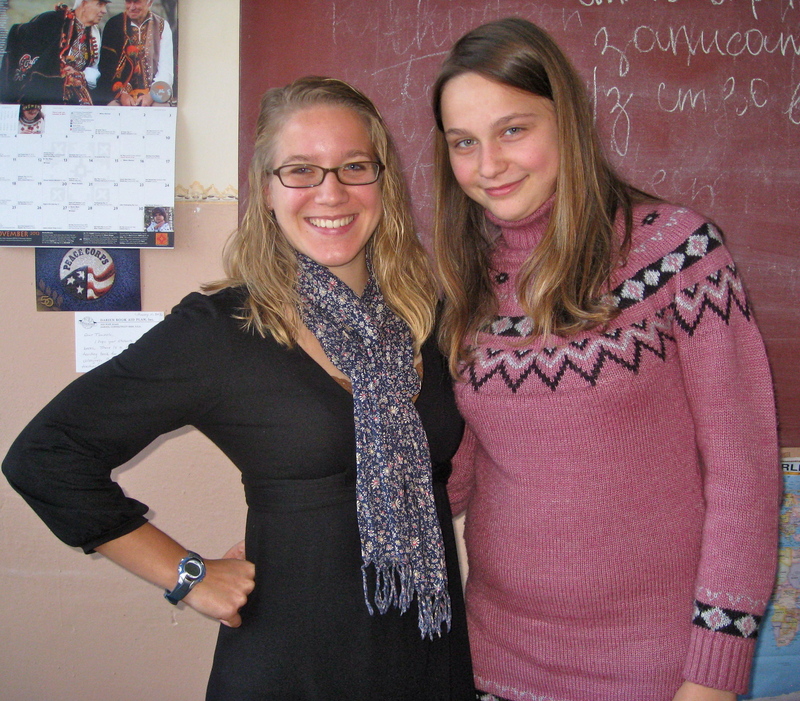 Read this article, featuring my fellow Obie and Ukraine (R)PCV, Samantha. This entry was posted in books/literature, climate, community, education, English Club, exercise, food, geography, health, Highlights, literacy, Peace Corps, pictures, running, teaching and tagged news, snail mail on 09.02.2012 by taplatt.